Strategically located at the crossroads between Europe, Africa and the Americas, with excellent connectivity by air, land and sea, Oporto is an ideal gateway to access these vast markets (including over 500 million consumers in Europe and 250 million in the Community of Portuguese speaking countries). Traditional yet modern, Oporto offers a cosmopolitan blend of rich Jewish heritage and contemporary feel, providing outstanding conditions to live, work and invest. It is the 3rd best city to invest in Southern Europe according to fDi intelligence/Financial Times. Hard to beat cost-quality ratios, at diferent levels - infrastructure, human resources, residential, commercial and industrial property, cost of living. Please visit this Invest Oporto short video. The Jewish Community of Oporto is a Community whose membership includes 150 members from 19 countries. The religious Jews and the secular Jews of the Community work together. There is a regular minyan and Kiddush every Sabbath. The Oporto Rabbinate is recognised by the Rabanut Harashit Leyisrael and the Religious Committee is comprised of orthodox members of Golders Green, London. The Community has its own financial resources and does not rely on external aid. On the contrary, it gives tzedakah via a vast network of Jewish organisations in many countries. There is a heated mikveh in the Oporto Synagogue and a mikveh lady (balanit). A tour of the mikveh is available on request. There is also a large natural mikveh, a waveless stretch of beach adjacent to a breakwater, about 7 km from the Synagogue. Oporto is a beautiful place to live. The Jewish Community of Oporto has weekly Torah classes and there is a nursery for children of up to 6 years of age absolutely free of charge for the members of the Community. The nursery is a precursor to the creation of the Jewish school of Oporto. There are several kashrut structures already in existence or soon to be created in the city. At this time there are a kosher hotel, restaurant, bar and store under the supervision of the Rabbi and the Community's mashguiach. Low cost kosher meals are also available. The products and ingredients used in the preparation of the meals meet the highest standards demanded by Jewish customers: chalav Yisrael milk, afiat Yisrael bread, glatt kosher meat, etc.. The Community provides primary care Chevra Kadisha, has bought graves in Israel to bury their dead and is seeking to purchase suitable land in Oporto to build a cemetery. There is no anti-Semitism in Oporto, the second largest city in the country, but the Synagogue has security guards at the door every day of the year. The Community has a security department and a specialised legal department to prosecute any criminals who may harm the Community in any way. The Kadoorie Mekor Haim Synagogue is the largest Synagogue in the Iberian Peninsula. The Temple includes not only a prayer room and a museum, but also spaces reserved for studying, a mikveh, a school, a library, a typography, a board room, a Community dining room, a kitchen, a pantry to house kosher food, a patio where a Sukkah is built for Sukkot, as well as apartments for the Rabbi and the Shamash of the Community. The Jewish Museum of Oporto occupies rooms in the first floor of the Synagogue. It is closed during Shabbat and Yom Tov, to both Jews and non-Jews. The main purpose of the museum is to spread awareness of Jewish history, Jewish culture and Sheva Mitzvot to non-Jewish students from Portuguese schools and non-Jewish tourists from all over the world. See TourismKadoorieMekorHaim on Facebook. Friends of Oporto Synagogue, founded as part of the Jewish Community of Oporto in 2015, is a club for kids and youngsters under the age of 18 which aims to strengthen the existing ties between the Jewish Community of Oporto and the descendants of Portuguese Sephardic Jews, so that they may in the future become full members of the Community. Known as the Kadoorie Makor Haim synagogue it is also called the “Catedral Judaica do norte de Portugal,” The biggest synagogue in Iberia it took nine years to build (1929 –1938). Helped by many people the Kadoorie family of Hong Kong donated the synagogue on land donated by the Rothschilds. Few people ever knew, but the medieval alleys of the Portuguese city of Porto on the Atlantic coast once provided cover for a persecuted minority at risk of being burnt at the stake. In the 16th century, a thick-walled granite house that still stands in a row of narrow buildings along a cobbled street held a dangerous secret. At the back, steep steps lead down to a warren of alleys ideal for conspiratorial comings and goings that helped keep an outlawed religious ceremony hidden. Four centuries later, the secret of the synagogue is out. The mystery began unravelling when Fr Agostinho Jardim Moreira, a Catholic priest, bought the four-storey house for use as an old people's home for his parish. When construction workers told him they had come across a false wall, he told them to pull it down - sensing a hidden tale. He had studied the city's Jewish history and knew his parish had been a Jewish quarter in the 15th and 16th centuries. He also knew that, after they were forced to convert to Catholicism in 1496, many Jews privately kept their faith and worshipped in secret. "I suspected that false wall was hiding something," said Fr Moreira. "I knew there had to be some kind of Jewish symbol behind it." A worker's sledgehammer proved his hunch right. Beyond the wall was a room with a medieval holy ark - a nook in the wall of a synagogue where Torah scrolls are kept. Only two other arks from the period have been found in Portugal. There has been very little published about the Inquisition in Porto. This is a short summary of two articles on the subject, one by Amilcar Paulo (a protégé of Barros Basto), A Inquisição no Porto, Achegas para a sua Historia, Separata de Douro Litoral-Boletim da Comissão de Etnografia e Historia-None Serie-Vol II, Porto, 1959, and Elvira Cunha De Azevedo Mea, A Inquisição do Porto, Separata da ‘Revista de Historia’ Vol I, Centro de Historia Da Universidade Do Porto, 1979, Porto. Professor Mea is presently writing a book about the Inquisition in Porto. According to Amilcar Paulo (deceased) on June 30, 1541 king John III ordered the Carmelite bishop, Baltazar Limpo, bishop of Porto to institute the Tribunal of the (un)Holy Office of the Inquisition. On February 11, 1543, the Tribunal held the first and only auto de fé. Three scaffolds were constructed. There were 84 penitents, of which 21 were burned in effigy, 3 women and 5 men were burned alive, 4 padeceram, 15 were sentenced to perpetual jail with sabenito and 43 received prison sentences between 1 and 10 years. The auto lasted until 5 pm, with 30,000 people in attendance. The Tribunal was extinguished in Porto in 1544. Paulo reproduces several historical documents such as the edict of king John III establishing the inquisition. Professor Mea, who knew Almilcar Paulo, is much more circumspect. She notes that not much has been added about the Inquisition in Porto since Alexandre Herculano’s classic , ‘History of the Origin and Establishment of the Inquisition in Portugal’ (1854). She does not give much importance to Herculano’s opinion that the Inquisition in Porto was motivated by vengeance of the Inquisitor, bishop D. Baltazar Limpo whom he describes as impetuous, obstinate, and fanatical. According to Herculano, the bishop was angry with the New Christians for not paying the cost of converting the synagogue to a church and the re-paving of Rua de São Miguel in the former Olival Judiaria. Apparently there were a great number of New Christians living in the Ribeira neighbourhood (the then docklands), selling ready-made clothes who complained of exorbitant rents. In 1533 and 1534 they made a proposal to the City to return to the place of their ancestors, the Olival Judiaria, and promised to contribute towards the construction of a church, (the present church of "Our Lady of Victory" on Saõ Bento da Vitoria street is believed to be the site of the former synagogue of the Olival Jewish quarter) and the re-pavement the street of São Miguel, where Uriel Acosta (Gabriel da Costa) was born. As of 1547, there still had not been an agreement. 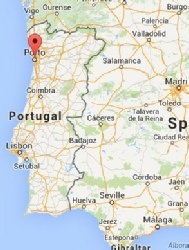 By that time bishop Limpo was no longer in Portugal. Mea, who writes twenty years after Amilcar Paulo, prefers to start anew, relying on five packets of documents then recently discovered at the Torre de Tombo, the national archive. Her partial analysis of the documents, which were in poor condition, indicates that cases before the Tribunal occurred between 1541 and 1546, with the greatest concentration was in 1542-1544. There is also mention of a visit by the bishop of Porto to Mesão Frio (up the Douro river) in 1542. Mea examined one document in which 56 witnesses were heard in one day resulting in the denunciation of 30 New Christians. Evidence also revealed that a good number (26) of the incriminated were absent, many for more than a year, some having fled to Lisbon and Lamego before leaving the realm. Mea finds cases from Porto mistakenly listed in the Coimbra Inventory of Inquisition cases (Inventario dos Processos da Inquisiçao de Coimbra,1541-46). There she finds 78 cases from Porto, some involving more than one accused. Analyzing additional sources, she found a total of 111 processes from Porto, some duplicated. Mea studied 54 cases referring to 93 individuals. Some files are incomplete. The tribunal was situated at the pousadas (manor house) of the inquisitor Jorge Rodrigues on Rua Chã. The prisoners were lodged in the bishop’s prison but in 1544 there is evidence of a new prison on Rua Escura. In one of the later processes (1545-47) of Leonor Gomes and João Serrão, merchants, we learn that the vicar, João Ferreira had replaced the bishop. The professor states that it is not possible to fully analyze the nature of the inquisition in Porto as the institution was in its infancy and there was a lack of general applicable rules throughout the realm, rather it depended a lot on the character of the individual inquisitors. In Porto, one of the Inquisitors suspected anyone whose parents were forcibly baptized or who lived with a New Christian, like Violante Dias and her husband Antonio Dias, imprisoned for two years. Another example is Genebra Gomes, a widow of 80 years, born on Rua de São Miguel, baptized as an adult in 1497 and who spoke Hebrew. Her case stands out because she prayed frequently in Hebrew and observed Pessach and Yom Kippur. Mea notes that the absence of 26 accused and an additional 7 whose whereabouts were unknown, is evidence of the economic power of Porto’s New Christians and their ability to easily escape the clutches of the Inquisition. Their economic power may also explain the rigid and inflexible attitude of many of the accused and witnesses who were uncooperative and refused to corroborate with incriminating evidence. Some witnesses were imprisoned, like Leonor and Eva Gomes, aunt and niece of Genebra (who also spent two years in prison) for interfering with witnesses. There were many appeals by accused persons and many allegations of illegality on part of the Tribunal, such as not releasing prisoners once their cases were completed. Pursuant to the documents Mea studied, there were at least two auto de fés in Porto, one on February 11, 1543 at the field near the gate of the Olival and another at the same place on April 27, 1547. The Tribunal in Porto ended with the papal bull of Paul III on July 16, 1547. It was never re-instated, cases from Porto were dealt with by the Inquisition tribunal of Coimbra. After corroboration by historians, the Portuguese Institute of Architectural Heritage authenticated a house as the site of a secret synagogue. The chance discovery solved an enigma that had baffled historians for years, said Elvira Mea, a lecturer who specialises in Jewish history at the University of Porto. Immanuel Aboab, a 16th-century Jewish scholar, had written that, as a child, he had visited a synagogue in the third house along the street counting from the 14th-century Our Lady of Victory church. But he didn't specify which side of the street, and archaeological digs had turned up nothing. Then came confirmation of the accuracy of Aboab's text: the house Fr Moreira bought was the third house down on the street the Jewish scholar had described. Historians had been thrown off by the fact that Aboab never described the synagogue as clandestine. His childhood experiences took place five decades after the forced conversion - at a time when secret Jewish worshippers would be tortured and burnt at the stake if caught - so there was no chance a synagogue could function in the open. In the 1920’s Captain Barros Basto started his campaign to return New Christians (Christian converts) to Judaism. In the 1930’s he was accused of a crime he did not commit and was cashiered from the army. This was overturned by the National Assembly. He is now known as ‘The Dreyfus of Portugal’. At its peak, he may have had 10,000 possible adherents. He founded a magazine called Halapid to help them learn about the religion of their ancestors. The Mekor Haim synagogue he founded is also known as the ‘Catedral Judaica do norte de Portugal’, a majestic art deco three-story building built between 1929 –1938.